Winners Only pioneered the modular office furniture concept over 20 years ago! Solid cherry and cherry veneer with a hand-rubbed brown cherry finish, engineered and constructed to last a lifetime. Executive and modular collection rich in details and features, including solid cherry and cherry veneer, raised panels, moldings, touch lighting, roll outs and hidden features which must be seen to be appreciated. Our widest collection, designed to fit perfectly in an executive office or at home, ranging from modular pieces to a 42" Computer Armoire to a 72" Desk. Constructed from solid cherry and cherry veneer. From a 36" flat top desk and to a 48" roll top desk, this traditional collection is a longtime favorite. Made from red oak and red oak veneer in 2 finishes, with all the features of our largest desks. Styled for smaller spaces and built to last. Cherry veneer and hardwood, 16" or 32" modular pieces offer flexibility, function and good looks. English dovetailed, fully finished drawers with full extension glides. Designed for modern lifestyles and individual tastes. Sleek computer desks in cherry veneer and solid hardwood in 2 finishes. Constructed with the same quality materials and workmanship as every Winners Only desk. 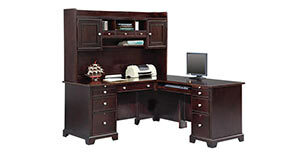 Beautifully crafted, contemporary home office furniture constructed from solid cherry and cherry veneer in a rich, hand-rubbed espresso finish with polished nickel-plated hardware. Our most popular Home Office Collection! Cherry veneer and solid hardwood with desktop walnut inlay. This collection offers a wide variety of desks with all the features and qualty you expect from Winners Only. Timeless, traditional design, constructed of solid cherry and cherry veneer with a hand rubbed finish. Distinguished by antique-style hammered hardware, distinctive leg detail and fully finished drawers. Smaller home office with matching bedroom companion pieces.